Food | Tony De Falco - Ahh..What do I know? Way back when, long before the distractions of the internet, hi def TV, and iPods, families actually sat down and ate dinner together. Sunday night was the BIG night when you pulled out all the stops and the cooking started before noon. Growing up in an Italian household in Brooklyn in the 60’s, we looked forward to it. Pasta was macaroni and tomato sauce was gravy and that was that. And Wednesday was definitely not Prince Spaghetti day, no matter what the TV told you. My father was the cook and he had 4 sons to do the prep and clean up work. It would all start with us sitting on kitchen chairs with a big stock pot between our legs and we would have to push tomatoes through a colander to separate the skin and seeds from the pulp. There is nothing like gravy from fresh tomatoes but here is the short cut using canned that you can make year round. Start by pouring some olive oil in the bottom of the pot, using medium heat, brown the sausage until almost done. Remove sausage and drain on paper towels.They will get finished later. Leave oil in pot. Put chopped garlic in pan, as much as you feel comfortable with. Don’t over do the spices as you can’t take them out but you can add more later. If you use the jarred chopped garlic, use about half a teaspoon. Sauté until slightly brown and then add can of tomato paste. Don’t fry the garlic past golden or it will caramelize and take on a nutty flavor. Cook the paste and garlic together, stirring constantly until hot. 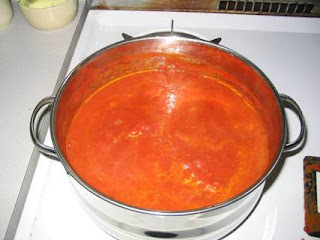 Pour in all three cans of tomatoes and stir together. Reduce heat to low and leave uncovered. Cook this for one hour, stirring occasionally. Sauce should have reduced by 1/3 at this point. Now add a few healthy shakes of the oregano, basil, and parmesan cheese. Pour a few dashes of the red wine in. You can also use cooking wine available at the supermarket but that’s no fun ‘cause you’ve got nothing to drink while you make this! Watch the pot and stir for the next hour or until it has further reduced and gravy is thick. You can now add back the sausage you browned or add meatballs you’ve already made. Some info from the guy that was there: If you remember in the Godfather, Clemenza, added sugar to his gravy. Do that here and I will come over to your house and hit you with a wooden spoon. In GoodFella’s it was onions, try it, and I’ll be back with the spoon. Anyway, there it is. Let me know how it comes out. Maybe next time we’ll make the meatballs! 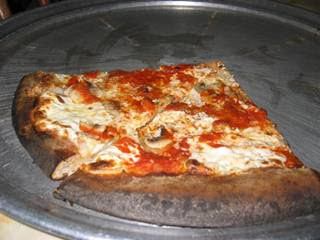 Without a doubt there is no pizza on earth like New York City Pizza. Just ask me and I’ll tell you. And I don’t mean the hole in the wall joints all over Rochester with the falling down banners that tout “New York Style” pizza. I’ve tried them all and they are all nothing more than a loaf of bread with ketchup and cheese whiz slopped on it. I mean pizza made and eaten in the city so great, they named it twice. Pizza with a crust so thin you can fold it and the crust is brown to black.I should know. I grew up, worked and sweated in one at 698 Fulton Street, Brooklyn New York. I’ve eaten so much pizza pie, I have tomato sauce in my veins. It’s hard to replicate the ingredients such as a 2000 degree oven, hard Brooklyn water, Italian deli mozzarella and straight off the boat olive oil but here it is, as close, as you can get in your home kitchen. Makes enough dough for two thin crust 10-12 inch pizzas. In a small bowl, put the yeast, sugar and water and stir until mixed. Place the mixture in a warm place for 10 minutes until a froth forms. Dump the flour in a large mixing bowl, add the salt and olive oil. When the yeast mixture is ready pour it on top of the flour and mix with a wooden spoon until a ball forms. Turn out on to a floured cutting board. Coat your hands with flour and knead the dough until it forms a ball with a firm consistency. Add flour as needed, a little bit at a time. Place ball of dough in a bowl that has been coated lightly with olive oil. Turn the dough around in the bowl so that it gets coated with the oil. Cover with plastic wrap. Let sit in a warm place (75-85°F) until it doubles in size, about 1 to 1 1/2 hours. If you don’t have a warm spot in the house, put it in the microwave oven and place a note on the door not to turn it on while it’s in there. At this point, if you want to make it ahead, you can refrigerate the dough for tomorrow. Just take it out a few hours before you need it. When it is ready, knead again, separate into two balls and flatten into two pizza crusts. Exact size and shape aren’t important. Do the best that you can and place the dough into a pan. I have found that the ones with the holes in them work the best if you aren’t using a pizza stone. Pre heat oven to 450 degrees. Pour a little olive oil on the crust and using the back of a tablespoon spread over crust. Pour a thin layer of tomato sauce on pizza and using the spoon cover crust. Sprinkle garlic, oregano and basil and then the parmesan cheese over sauce. Top with mozzarella and pepperoni then place on middle shelf of oven. Set timer for ten minutes. When time is up, open oven, rotate pan and re set timer for 5 minutes. The time isn’t set in stone as all ovens cook different so keep checking pie and pay attention to the smell. You’ll know when it’s done by that alone. When your crust is golden brown and the cheese is melted it’s time to take it out. Let it rest for a few minutes before slicing, put some Jerry Vale on the stereo and open a bottle of Chianti. And don’t forget the red checkered table cloth! Remember pulling into a roadside diner with the blinking “Eats” or “Mom’s Home Cooking” neon sign? Well so do I. Even better yet, I was a short order cook in one of those joints back in the 70’s. The diner had been there since 1930 with the same owner and the customers raved about our meatloaf. Here’s how I did it. Pre heat oven to 350 degrees. Get out a big bowl and break the egg and add a splash of milk like you are going to make scrambled eggs. Whisk until yellow. Dump in ground beef and mix together. Add a good dash of bread crumbs so that you can’t see the top of the meat. Sprinkle on garlic powder, as much as you like. Give a good shake of onion powder. Throw a little more milk on there and stir the whole mess together until it forms a firm loaf. You can always add bread crumbs or milk to change the consistency. Put in metal loaf pan and place in oven for 45 minutes. Take out and check loaf by piercing top and look for clear juices. You may need to put back in the oven for an additional 15 minutes if you like it well done. Remember you are going to be making gravy that takes about 15 minutes so don’t overcook it yet. Remove loaf from pan, put on serving platter, cover with foil and keep in a warm place. To make the gravy place the loaf pan directly on a stove burner. Here’s the secret to making gravy without lumps. Take four level tablespoons of flour and without turning on the burner, slowly, using another spoon, mix the flour into the pan drippings until you have a paste. If you are using beef broth slowly pour into pan while turning the heat on low. Mix the paste with the broth. If you are using bouillon cubes, add two cups of water and mix. Don’t add cubes yet. Turn heat to high and bring mixture to a boil, stirring constantly. Keep an eye on it so that it doesn’t boil over. Once it comes to a boil add cubes and smash them down with the flat side of a spoon. If using broth don’t add cubes! Boil gently for 5 minutes and viola…you’re done. And don’t forget, slopping ketchup on top of meatloaf is a felony where I come from, so don’t even try it. Serve with real mashed potato’s and corn with butter. It doesn’t get any better than this!